Front desk office job comes with a whole lot of responsibility, especially if you are working in a hotel. You have to welcome guests, help them check in and check out, always be at their service, be friendly, responsive and professional as much as you can and show that you are able to multi-task very easily. You should also say that becoming a front desk manager or front desk person is about being hospitable, courteous and doing your job correctly. That’s about it! Front desk receptionists have to usually perform many different administrative tasks and make an effective impact on the customers regarding the company. Customer service is their prime role and responsibility. Communication and interpersonal skills are the top skills that help them do their job easily. The following mentioned are few top receptionist interview questions and answers and tips on how to be a good receptionist. 1. So you want to become a receptionist! Tell us something about you? When you want to work as a receptionist or be a part of the front office staff, you have to have some knowledge on how to answer a few basic questions before the difficult ones come along. One of the most common front desk job interview questions, that most receptionists ask is what you can tell them about yourself. While answering such questions you should discuss your previous employment experiences. The question is a good opportunity for you to focus on your professional goals, speak about your skills, achievements and strengths and provide a good summary of your professional self. You don’t have to discuss about your personal life here. 2. What were your responsibilities in the previous front desk office job? This one could be a great opportunity to speak about some of the nitty gritty bits of your old employment experiences. You must also focus on the duties and responsibilities that will mostly relate to the position you are hoping to get. When you are speaking about your responsibilities, you must always remember to stay positive. You don’t have to reflect on any of the previous experiences in a poor manner. One of the best ways in which you can get ready for this question is by simply looking at your resume and look at all the responsibilities you have listed. Think of how you can elaborate and speak on each point. You must also focus on the instances and the accomplishments that have helped you. 3. How will you deal with the negative customer? It could be slightly challenging to speak about negative experiences that could cause you to feel angry and frustrated. Your employer should want to know how you can handle an unpleasant situation because since you are a receptionist you will always have to interact with those who regularly visit your company. So the best way to answer this question is by thinking of the times when you have actually been upset or mad at someone because of their behaviour. You should also explain what this situation is and how have you been able to handle it. You must also make the customer service philosophy and goal here. Be calm and positive too. Here are some qualities and strengths that you will want to highlight in this section as a receptionist or someone who is working at the front desk office. Employers during this point want to see what you are all about. So make sure to speak about your organizational skills, about maintaining a good and positive attitude. Third, speak about your communication skills, dependability, computer fluency and technology skills. Before you answer this question properly, make sure to touch upon a few topics like professionalism, how good you are at things like multitasking and how customer service oriented are you. These points really matter so don’t forget to mention them. 5. Why are you applying for this job and leaving your current position? This is a very common question. In case you have been terminated, you should answer this question in a positive manner. You should never leave a bad impression by saying something bad to a former employer. You should say that you love having challenges in your life and the time has come for you to broaden your perspective and accept bigger and better challenges. You should also speak of your previous experiences. You could also say that the previous employer and you both have decided that it was best if you start looking at a few new opportunities that will fit your talents, abilities and skills. You are also confident that this opportunity is an excellent fit. You have a lot of experiences and ideas that could be brought out to the table to be discussed. 6. What are your salary requirements? You should find out what the salary is for the job and if what you have in mind is ahead of what you should be saying. If no salary has been posted, then do some research. You should also find out in the market what is being paid and what you are worth. You should make a salary offer that is reasonable. You should also try your best to avoid making salary offers if you can. You may speak to an employer if they do have a salary range and what do they usually pay a person with that position. 7. How can you handle stress? This service desk interview question is very common and will be asked to you while attending a front desk interview. Always remember that people have to deal with stress at some point of their lives. You should speak about how you are able to work under pressure and not allow the pressure to control you. While answering this question, you could say that you never allow stress to take away your motivation and that you can balance yourself because of your healthy, fit and active lifestyle. You can also speak about how positive you like to stay and that it helps you give better and positive reactions. 8. How long will you work here if you have been hired? When you answer this interview question for a receptionist, make sure to come across as positive as you can. You must let the interviewer know how glad you are to be sitting in front of them and that you are thankful for this opportunity. You should begin your answer by saying that working for them will be a very good and attractive opportunity for you as it helps you gain both knowledge and experience in the front desk world. You could say that, would like to pursue your career as long as you can, that you like meeting new challenges and that this hotel is everything you have been looking for so leaving is clearly out of question for you. Try to gain their confidence through this. 9. How will you organize your schedule? In this, the interviewer is basically trying to see how organized you are as a person. He wants to see how efficient you are as a persona and how you will handle changes if there are any in your work schedule. In this answer, you must, first of all, include how you have been organizing stuff in the past, how you have organized meetings and how they worked successfully. Speak about how much you have learnt from your past and the previous experiences and that maintaining sheets, documents and files is very easy for you. 10. What are your strong points? This receptionist job interview question can help you with polishing some of the qualifications and skills that you have already enlisted inside your interview. You should come up with persuasive answers so that the interviewer is convinced that you can handle the job easily. So when you are answering this question, you have to speak of your friendly nature, your level of confidence, your communication level and patience. You can always add a few strong points and give more evidence regarding your previous experiences and how well you have scored in them. That will make things much easier for you! 11. Are you a flexible person? Can you work in different shifts? Being a flexible person is very important these days, especially if you want to work at the front desk department. So if you think you can handle long hours and rotator shifts, this job will be yours entirely. You have to know how to work and handle stuff like these as your job clearly calls and demands for it. So when your employer asks you questions related to flexibility, say that you are comfortable and that you can handle different shifts easily. Let them know that you can! 12. What will you do if there are complaints from a guest regarding the service? Unhappy guests will always give you bad reviews whether it is about the company or the hotel and it will take just one person to completely shatter a good day when you are working for everyone. Whatever the cause may be, there are plenty of unhappy customers who can still be our guests and hope for making it better in the future business. So when you are speaking to the customer, make sure to listen to them first. Second, thank them for letting you know where the problem lies. Third, convey your apologies to the guest. Third, see what the guest is looking for as a solution. Fourth, act on the solution. 13. What do you know about us as a company? This is also a very common question we bet you will be asked during an interview so make sure to prepare this from beforehand if you want to answer. You should do some good research of the company, go to their about us section and see what they have written. Check Google and see what you can gather about the company. Try to see as much as you can so that when the time arrives, you can answer all questions easily. While answering this interview question for a receptionist, you must enlist all those points about yourself that you think makes you a better person. You could start off by saying you are an enthusiast and that you are willing to work long term. You are an organized person and can work hard towards achieving goals, you should also have the right place in order to show off your experience and skills. Show that you are a disciplined person and good natured so that they are convinced to hire you. 15. Do you know MS Office? You should have a good idea about MS Office. You have to have some idea about Microsoft word, Microsoft power point etc. All of this matters when you are attending an interview. People want to know whether you can handle computer work since you will be expected to handle this all the time. MS Office, Outlook and Powerpoint are basic stuff. 16. Where are your main competitors? Interviewers would like to keep a check on how much you know about the company or whether you have a good idea about the competition. In order to answer this question, you must do enough research on the company and investigate about them. If you know about their past and upcoming challenges, you will surely be able to handle the interview and ace the test successfully. Just make sure you have done your bit so that nobody questions you about it. Getting a job in this competitive market is not so easy. The number of applicants are double the number when compared to a number of positions. The front desk receptionist is an important part of any organization. They need to be friendly as well as organized. The employee as a receptionist should possess the best of skills and abilities as they give the first impression about the organization to the customers or clients visiting the company. Some of the best tips that you need to follow are by creating a strong resume, prepare some of the common questions asked in a front desk receptionist interview, try a mock interview etc. What makes a receptionist best? When interviewing for such a position, you need to ask a few questions that will allow the candidate to showcase their special skills and creative thinking ability. 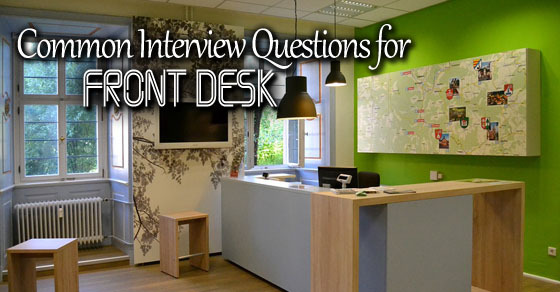 Here are few interview questions for hotel front desk clerk which are divided into sections based on their type and model. How will you make sure your guest feel welcome, even while waiting? How do you deal with situations when two customers complain simultaneously? If you had to deal with two important customers, one over the phone and the other face to face at the same time, what would you do? What will you do, when one of your company employees is late for a meeting with a guest who has arrived early on time? What is the process of calculating RevPAR(revenue per available room)? What according to you is the best customer service? Tell us about the experience you had with POS systems? What is the process of prioritizing tasks? How distributing deliveries is done after accepting, in your previous job? Are there any situations when any customer has left your service unsatisfied. If yes, then what have you have learnt from it? Ever had any disagreement with your senior and how did you deal with it? Did you ever experience a raging customer? Has there been a time when you completely lost patience? Did you ever have to face a situation when one of your co-worker was at fault? Have you ever took an important decision, when your boss is not at work? What was it ? Always remember that working at the front desk is not going to be easy. Just because it is not the highest paying job, in no way should you expect receptionist job interview questions to be easy for you. The ones that have been written above are certainly helpful for job interview preparation and have also been of good use to those who have attended interviews in the past. If you have liked and agreed with them and found some help from it, do let us know in the comment box below. We would love to hear from you! Also if there are some questions related to receptionist hiring you have in mind, let us know more. On that note, good luck and we hope you will successfully land that front desk interview.